(1) Kailasanath, K., Review of propulsion applications of detonation waves, AIAA J., Vol.38 (2000), pp.1698-1708. (2) Kailasanath, K., Recent developments in the research on pulse detonation engines, AIAA J., Vol.41 (2003), pp.145-159. (3) Roy, G. D., Frolov, S. M., Borisov, A. A., and Netzer, D. W., Pulse detonation propulsion: challenges, current status, and future perspective, Prog. Energy Combust. Sci., Vol.30 (2004), pp.545-672. (4) Kasahara, J., Hasegawa, A., Nemoto, T., Yamaguchi, H.,Yajima, T., and Kojima, T., Performance Validation of a Single-Tube Pulse Detonation Rocket System, J. of Propulsion and Power, Vol.25(2009), pp.173-180. (5) Kasahara, J., Hirano, M., Matsuo, A., Daimon, Y., and Endo, T., Thrust Measurement of a Multi-Cycle Partially Filled Pulse Detonation Rocket Engine, J. of Propulsion and Power, Vol.25(2009), pp.1281-1290. (6) 山口敬之，松岡健，八桁純，笠原次郎, パルスデトネーションエンジン用入口流体駆動バルブに関する研究, 日本航空宇宙学会論文集，第57巻(2009), pp.141-147. (7) Kasahara, J., Liang, Z., Browne, S. T., and Shepherd, J. E., Impulse Generation by an Open Shock Tube, AIAA J., Vol.46(2008), pp.1593-1603. (8) Sato, S., Matsuo, A., Endo, T., and Kasahara, J., Numerical studies on specific impulse of partially filled pulse detonation rocket engines, J. of Propulsion and Power , Vol.22 (2006), pp.64-69. (9) Endo, T., Yatsufusa, T., Taki, S., Matsuo, A., Inaba, K., and Kasahara, J., Homogeneous-Dilution Model of Partially Fueled Simplified Pulse Detonation Engines, J. of Propulsion and Power, Vol.23(2007), pp.1033-1041. (10) 遠藤琢磨，八房智顕，滝史郎，笠原次郎, パルスデトネーションタービンエンジンの性能に関する熱力学的解析, Science and Technology of Energetic Materials, Vol.65 (2004), pp.103-110. (11) Endo, T., and Fujiwara, T., A simplified analysis on a pulse detonation engine model, Trans. Jpn. Soc. Aeronaut. Space Sci., Vol.44 (2002), pp.217-222. 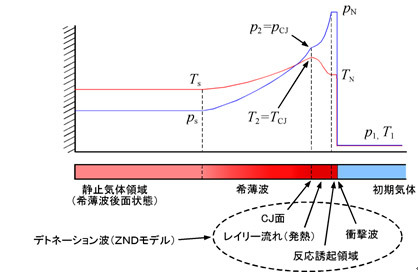 (12) Endo, T. Kasahara, J., Matsuo, A., Inaba, K., Sato, S., and Fujiwara, T., Pressure history at the thrust wall of a simplified pulse detonation engine, AIAA J. Vol.42 (2004), pp.1921-1929. (13) Zeldovich, Y. B., To the question of energy use of detonation combustion, J. Propulsion and Power, Vol.22 (2006), 588-592 (translation of article originally published in Russian in Zhurnal Tekhnicheskoi Fiziki Vol.10 (1940), pp.1453-1461). (14) Heiser, W. H., and Pratt, D. T., Thermodynamic cycle analysis of pulse detonation engines, J. Propulsion and Power, Vol.18 (2002), 68-76. (15) Wu, Y., Ma, F., and Yang, V.，System performance and thermodynamic cycle analysis of airbreathing pulse detonation engines, J. Propulsion and Power, Vol.19 (2003), pp.556-567. (16) Wintenberger, E., and Shepherd J. E., Thermodynamic analysis of combustion processes for propulsion systems, AIAA Paper 2004-1033, 2004. 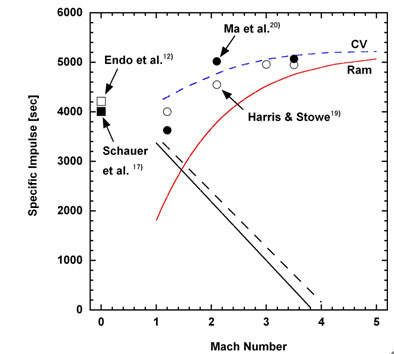 (17) Schauer, F., Stutrud, J., and Bradley, R., Detonation initiation studies and performance results for pulsed detonation engine, AIAA Paper 2001-1129 (2001). 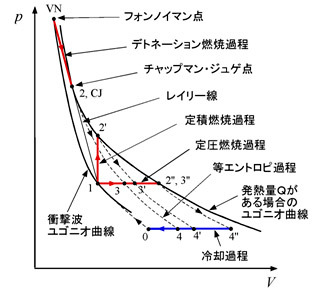 (18) Talley, D. G., and Coy E. B., Constant volume limit of pulsed propulsion for a constant ・ ideal gas, J. Propulsion and Power, Vol. 18 (2002), pp.400-406. (19) Harris, P. G., Stowe, R. A. Ripley, R. C., and Guzik, S. M., Pulse detonation engine as a ramjet replacement, J. Propulsion and Power, Vol.22 (2006), pp.462-473. (20) Ma, F., Choi, J.-Y., and Yang, V., Propulsive performance of airbreathing pulse detonation engines, J. Propulsion and Power, Vol.22 (2006), pp.1188-1203.